What is TEST PLAN in software testing? What does it have in its bag? In this post we will look at the most important concept in Software Testing. Testing like any other project is driven by a test plan. The activities to be performed in the entire project are included in a document known as ‘TEST PLAN’. It acts like an anchor for designing, execution, reporting , tracking and other activities related to the testing project. The below are questions related to test plan, try to answer them in one single sentence. Yes! you read it correct, one single sentence. What needs to be tested ? How Testing will be performed ? What should be assigned ? Ans : A test plan defines the scope, approach, resources, responsibilities, Effort Estimation, and risk management for a project. All the questions are answered in a single line separated by commas. Read again and you will understand it easily. 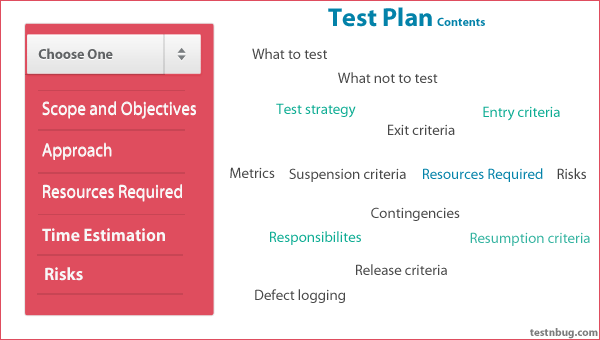 Contents of Test Plan : What does it have ? The purpose and scope of testing are included in introduction. ‘Purpose’ is to provide feedback about the quality of product. ‘Scope’ is about what features to be tested and what features will not be tested. Description of overall strategy and approach to testing are included by breaking down the huge task into small and manageable tasks. It identifies the right type of testing to effectively test a given specification of feature. The techniques, testing tools, automation (if any) are included. List of Non- Functional tests to be performed. A set of guidelines used to determine whether a system under test is ready to move or enter a particular phase of testing. e.g :We can start System testing once the code has passed unit testing. A set of guidelines used to determine whether a system under test is ready to exit a particular phase of testing. When exit criteria is met, either the system under test moves on to the next test phase or the test project is considered complete. The testing process is suspended when no further testing is feasible. It can happen due to several reasons like the system under test repeatedly fails or crashes (due to defect). When the defect is fixed and testing can be resumed , is known as resumption criteria. These criteria’s are normally mentioned in the test plan which helps to save the project time and cost. Test plan, Test Design Specification, Test case documents, Test logs, Test execution reports, Bug Reports, Test summary reports, Test data sheet etc are called as Test deliverables. The list of all the assumption’s made by the testing team will be maintained here in this section. The list of all the potential risks and corresponding plans will be maintained in this section. Employees might leave the company in the middle of the project. Unable to deliver the project with in timelines. Bench strength should be good. What needs to be skipped in case of imposed dead lines. Execution to be on priority basis. • The group may include the developers,testers, IT operations staff, user representatives, technical Support, data base team etc. Facilities required , Hardware required, Software required, Special requirements such as purchasing the licenses based on certain needs are considered. Specify test needs by skill level and identifying training options for providing necessary skills. Team without proper skills for the project tend to lag in delivery within time lines. The process of Defect logging and tracking the defects is included which has the details of tracking system like, how to set the priority and severity of the defects, the owner ship of defects and Management. Metrics means ‘measurement’ which is important for monitoring the test process. It contains the results of the number of tests cases executed, number of failed , Defects logged , Pass percentage etc. Who has approved , when it is approved, will be maintained in this section. The sign off and approval is the first step to start testing. Ex: Test Manager John, Approved on April 25 2015 . The release criteria is the final step before it is handed over for further process. It contains percentage of test cases passed, known defects to be covered in the next release, Risks associated and their contingencies. The below are few of them. For all open bugs, documentation in release notes with workarounds. This post might look lengthy due to the contents listed. But, I have tried to present it in way to help you understand better.